New Delhi: Amity India Immersion Program concluded today at Amity University Campus, Sector-125, Noida. As part of the 2 week long exchange programme, 8 students from Brunel University and 3 from University of Kent, UK pursuing different programmes stayed at Amity University and gained an insight into India and the Indian way of life. During these two weeks, the students were attached with “Buddy” students from Amity International Business School who helped them throughout their stay in myriad ways, thereby making their learning fun filled. During the Program, foreign students learnt about Indian Economy and Business Environment, growth of Indian Science & Technology, Indian History & Religion, Pitfalls and opportunities of doing business in India, Indian style of management with concentration on self-awareness, Stress Management and Yoga meditation. Addressing the students during the valediction ceremony, Prof. (Dr.) Gurinder Singh- Amity Group Vice Chancellor appreciated foreign students for their curiosity, patience and excitement to learn new things in India. He thanked them for reposing trust in Amity and providing a valuable insight into their country’s culture, traditions and values which was mutually beneficial. He wished them luck in their future endeavors. Addressing the gathering, Dr. Sean Holmes, Vice Dean (International), College of Business, Arts and Social Sciences, Brunel University, UK expressed his pleasure in being part of the Immersion program and applauded Indian students for their passion to learn, their inquisitiveness and their willingness to ask questions. 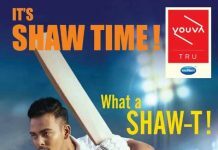 He averred that his overall experience in India has made him a different individual altogether and he is going back to his country enriched and enlightened. During the occasion, foreign students shared their experience of Indian culture, traditions, cuisines, historical places during their stay and how much they enjoyed Indian hospitality. George John Hudson from Brunel University, UK thanked Amity for hosting the Immersion progranme during which he made new friends, enjoyed vibrant India and experimented different cultures, languages and cuisines of India. He stated that the program has improved his personal and professional skills and he is going back home richer. Ms. Eloise Eliza J Madge from Brunel University, UK appreciated the perfect blend of various important modules which were delivered to them during the Program and stated that with globalization, it has become very important for students to be updated with the global ways of doing business. She stressed that she will share the interesting and informative things that she has learnt in India with his friends in UK. Miss Eleanor Middlemass- University of Kent, UK, while sharing her views, expressed her amazement at the impressive range of Indian cuisines and languages. She stated that her experience during the two weeks programme has been a memorable one and she enjoyed discovering India during her trip. 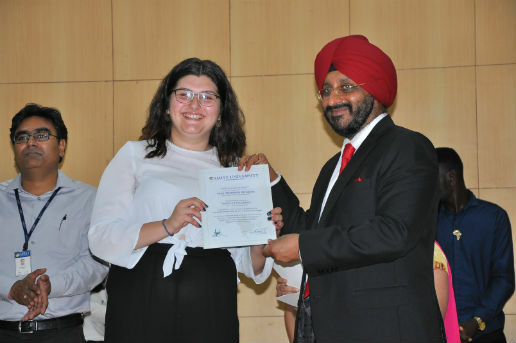 During the Ceremony, foreign students were awarded Participation Certificates and “buddy” students were awarded Appreciation certificates by Dr. Gurinder Singh.